I used to always wonder if there was something that parents of the “good wrestlers” were doing differently. Over time, I’ve observed that there are definitely common characteristics and actions of these parents. 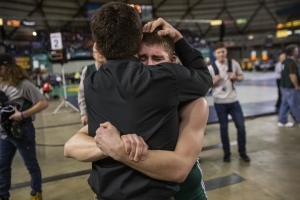 There are no guarantees, and plenty of wrestlers have found success despite not having parents with these traits, but it certainly can’t hurt to put your best effort forward. Also, when I say “successful” I mean the wrestler makes continuous progress while enjoying the sport (and keeping their relationship with their parents in tact). Yes, they win and win at high levels. But it’s not about how quickly they find success, just that they do. 1. They actively find ways to help their wrestler improve – They consistently take them to practice, seek good coaches and training partners, and actively take them to tournaments and camps to get mat time. They are always finding new challenges to keep them forging ahead. 2. They teach them about drive, commitment and sacrifice by doing it themselves – Driven parents are willing to travel, they adjust their schedule to make practices, and they sacrifice their weekends to be on the mat. They also demonstrate these traits in their own work and personal life, thus leading by example. 3. They find a balance between positive and negative motivation – Each child is different as to what motivates them, but you can push them to be their best and be positive at the same time. Being positive doesn’t mean coddling or praising them for things you expect, but it DOES mean recognizing when you are proud of an accomplishment or their hard work. YES, there are some serious 8-year old studs whose parents constantly berate them, but that motivation is short-term. They win matches to avoid getting yelled at, not because they love the sport. The ones who have parents that find a balance between pushing them and building their confidence are the ones who find long-term success. 4. They hold them accountable – When wrestlers are younger you tell them what to do and teach them to work hard, but as they get older THEY need to own the training and they must find the motivation from within in order to achieve new levels. Successful wrestling parents help to keep them focused while also giving them space to fail and learn on their own. 5. They do not tolerate bad behavior – Nobody likes to lose, but if their wrestler throws a fit on the mat, it’s addressed right then or they take them home. 6. They help them bounce back and not quit because things are hard – Part of wrestling (and life) is learning how to fight through adversity. Successful wrestling parents don’t tolerate excuses like “I’m tired”, “my tummy hurts” and “I don’t feel like it”. Wrestling is a tough sport and kids need to learn how to do hard things…and they CAN do hard things. 7. They understand the role of parent vs. coach – They let the coach do the coaching and they focus on being the parent. They don’t criticize their wrestler in the car after practice and they don’t tell them things they need to be doing after a match. Instead they concentrate on addressing things like working hard, not giving up, and being a good competitor. 8. They know when to take breaks and back off – The best wrestling parents sense when it’s time to take some time off OR if they are pushing too hard. This could be a week, a month or even a full season. Whatever it takes to re-charge the batteries and come back with a passion for the sport. Have any others you would add to the list? Feel free to comment below. They help establish goals for the wrestler. As the child gets older they establish there own goals. When they are young the parents need to promote this type of thinking. Each season needs to be a new journey and goals give them something to chase week in and week out. Setting goals is a very important step. But helping your wrestler understand and help them layout that path to reach said goals is, in my opinion, way more important. Your athlete needs to fully understand what is necessary to reach the goals that have been set forth and they have to buy in fully. A good coach/parent works with their wrestler to set goals above and beyond an easily attainable one so the final outcome is not a full disappointment but still a very good outcome which also leaves room for growth and future goals to strive for. If you can get your athlete to buy into the plan and they are in control the possibilities are endless. They tell the wrestler how much they enjoy watching them wrestle. They have the same high five, hug, or smile with losses as they do with wins. This keeps the wrestlers from being confused about the parents love and acceptance of the child, vs the need to win to make the parent happy. Nice article. I can totally relate. Definitely number 5 in our family. Always have respect. I really liked this article. The only thing I would add is that “let the coach do the coaching” is solid advice but it assumes that all coaches are competent. (Which sadly, they are not.) and/or that they are right coach for your child. I have seen parents stick with a coach well past when they probably should of sought a different team for their coach. I know parenting of wrestlers has dramatically changed in 40 years. But my parents Harry R. Furst and Jean M. Furst added something i consider MOST IMPORTANT….LOVE. I LOST THE STATE CHAMPION MATCH IN THE LAST 3 SECONDS TO A GUY I HAD PINNED 4 TIMES. A FULL SCHOLORSHIP TO AUBURN. WAS WITHDRAWN BY THE IDIOT AUBURN COACH AS I WALKED OFF THE MAT. 3 WKS LATER I FLIPPED OVER MY BACK INTO A PINNING POSITION THE DIV I 3RD PLACE 167LB. TO WIN A SCHOLORSHIP TO A TOP 10 DIV 1 SCHOOL….MY PARENTS NEVER SUGGESTED A MOVE OR A NEW STRATEGY THEY LOVED AND WERE PATIENT WITH ME AND PROVIDED A TYPEWRITER AND PAPER TO HELP ME WRITE 45 INDIVIDUAL LETTERS SEEKING A REDEMPTIVE MATCH……. All good points. It’s a fine line learning as a parent. I got the best advice from a old coach years ago. I was the guilty party in the car on ride home. Coach explained to me that your son or daughter feels bad already about losing. Let them deal w/the loss & don’t bring it up while driving home unless they start the dialogue w/you. I heeded that advice & definitely have seen a difference. And I always find something to tell him he did good. They know they lost or did something wrong. But the car conversation has worked wonders for us. He is 14 now & started wrestling at 11. He now asks & seeks advice from me going home. Best advice I ever received and it works. They eventuallly will come around. But the vehicle is not the place to start coaching and pointing out all there faults. And I always tell myself that he still is a kid & should have some fun. From me grilling him 4 years ago non-stop to stopping it. 3 years later he is asking me for advice. That in my book is a WIN alll day long. I also believe that they should make there own descision on 1 or multiple sports to participate. My son played 3 sports from 2nd. grade Til going into 9th. grade. But it was his choice w/no pressure from Mom or Dad. Some kids choose 2,3 sports. Ours asked both me & his Mom if we would be mad if he just concentrated on wrestling & that’s it. Our only comment was we will support what ever you choose. But make sure your making the choice for the right reasons. Not peer pressure & stuff. His answer- I want to just concentrate on wrestle so I can get better. The rest is history. As the parent and grandparent of many successful young men I have read all the comments and all are very true. For many years I have watched as parents berated kids when they have lost. I have stepped in a few times with parents I knew and told them to stop and speak with me. I have also stepped in as I watched a parent slap a kid in the corner of the gymnasium and called the police and had the parent removed. I am a strict parent, grandparent and do not tolerate poor grades, not acting when told to do something, sassing etc. I told one grandson who was having a hard time and didn’t want to go to practice that he could stay home but the young men who had beaten him would be in their wrestling rooms practicing, and every day they practice and you don’t they move farther and farther ahead of you. “Is that what you want?” He said no and immediately got up and got ready for practice. I love the sport of wrestling and all the good and wonderful things it teaches young men and now young women. It has helped keep kids in school that would have dropped out. And then seen them have successful lives. Please continue to work with young children with a positive and constructive attitude! Level Up Wrestling Center is a youth wrestling center in the East Cobb area of Marietta, GA. Our job is to help wrestlers achieve breakthrough moments, no matter what stage they are in. Whether you are a beginner learning for the first time or an experienced wrestler competing for a state or national title, we can help.